The seminar was this morning at 9:00. I accidentally slept until 8:50 and arrived at 9:10. Thankfully, I only missed the formalities. The woman who led the seminar was an American Italian woman named Vickie. She was very fit and tiny. She had so much energy and was great at explaining. She was also concise and funny. We learned CPR and then we learned how to operate an AED machine. That is basically like a portable version of those big shock guys on Hospital shows. You know. The ones where they hold these big electric things in their hands and yell, "Clear!" and "Charging!" Anyway, AED machines are placed in most buildings and public transportation. They are about as frequent as fire extinguishers now. They have two sticky electrodes that you are supposed to stick to the person's chest. They connect to a box. The box has a button which you push to administer the shock that will jumpstart the person's heart. The reason that doctors yell "Clear!" is so that everyone moves away from the body because the shock can be very dangerous to a healthy person. We were all sitting on the floor practicing our AED skills and Vicky asked for any questions. There were the standard kind of question you get in this type of scenario. They are always nit-picky and dumb. People usually ask questions that have already been answered in the course of the talk. Or they are asking questions that will never be relevant because they are so obscure. Example: "What if the person has just eaten Chinese food? Doesn't Asian food make the body more susceptible to electrification?" No one actually asked that. But you get the picture. I usually spend those Q and A sessions thinking, "I wonder which question has NEVER been asked before?" You just know that a person in that kind of job has heard all of them. My mind wanders into thinking, "How can I ask the ONE question they have never heard before?" I am highly competitive and I must admit that I play a contest with everyone else to have the BEST question. That it why I blurted my question out without thinking. "Could the AED be used as a weapon?" Vicky laughs and says, "Well, that's a freaky question! I have never heard THAT before!" I do an internal victory dance. I have won the invisible contest. Vickie continues: "That question is downright freaky, isn't it?!" She looks at all the other people in the room to confirm that my question does in fact display my pathology. 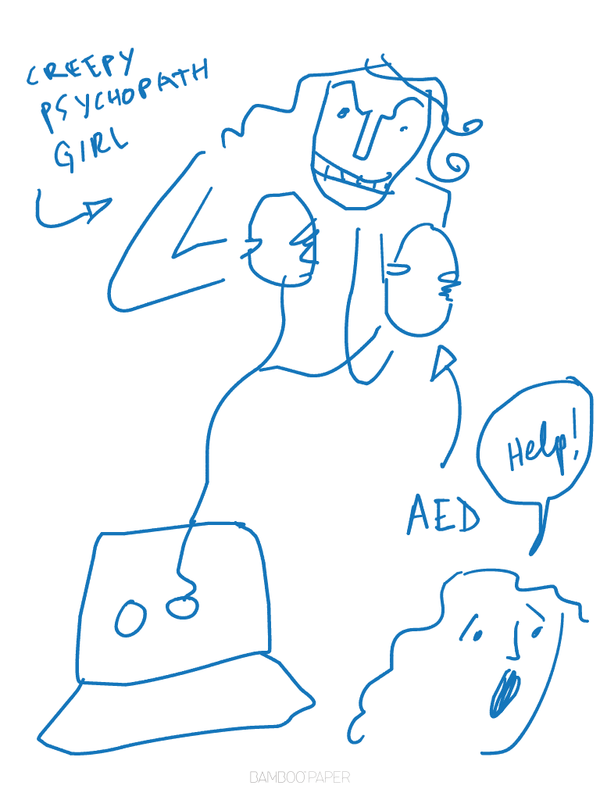 She then elegantly steers the conversation away from using AEDs as weapons and we move on. 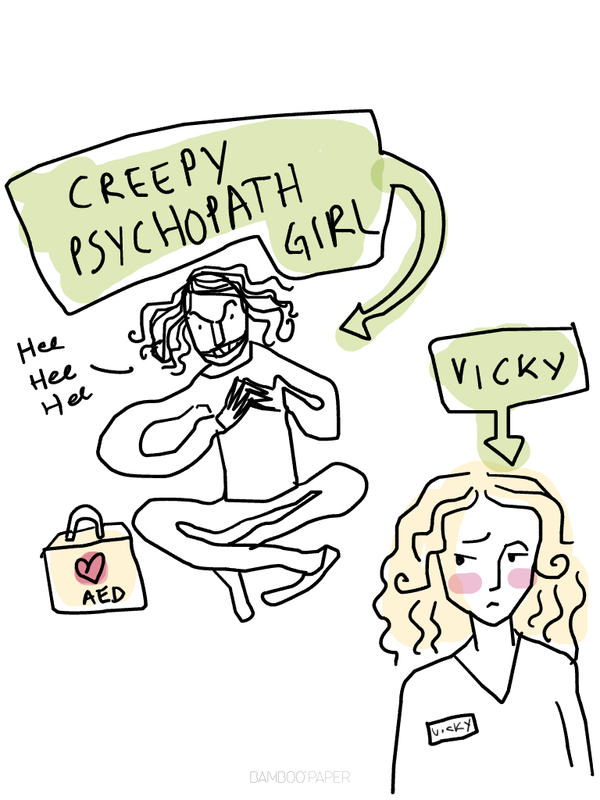 But I can sense that she has now labelled me in her mind as Creepy-Psychopath-Girl. She doesn't let me practice the Heimlich on the babies. Just kidding. Actually, it all turned out OK. She wasn't as up-tight about my question as I thought. Although she did say that it was weird and no one had ever asked it. I do think she was momentarily derailed by it. I guess I am THAT kid. You know that kid. It's the one that always has to say the opposite or the weird thing just to throw everyone off. After the seminar, once we had all been certified and I had snagged a donut before they took them away I approached Vickie. I told her, "I promise never to use my new skills for evil." She smiled and we ended on a good note. I could save your life...Or not!